Kids Preferred ASTHMA FRIENDLY yellow pancake style cow, named CUDDY. It has a white muzzle, yellow satin ears, and yellow terry body. 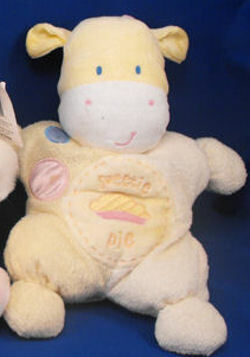 It has pink and blue satin spots and embroidered on the tummy is SWEETIE PIE and a pie slice. I need the big one, NOT the little one that has the rattle. My daughter was given this yellow giraffe when she was four months old and has carried it and loved on it everywhere since. She is now five and recently went to her Dad’s, where it was misplaced. I need another one of these stuffed animals desperately. Please if anyone knows where I can find one it would not only mean the world to me, but to my daughter as well! Please help! I have searched everywhere, and they are always sold out! Hi there, two on ebay 310325823513 and 400245260787. Thanks, Brenda. I’ve notified both of them. Have you found the cow yet? I have purchased one back last year and thanks to your most resent post will have this one as a back up! !,!thanks!